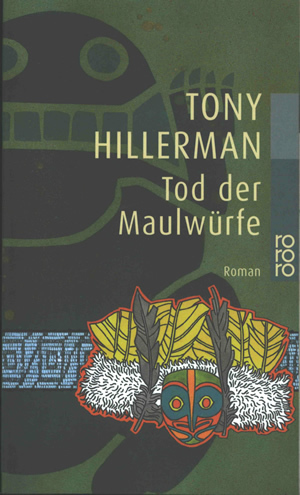 This is the paperback German rororo series edition of People of Darkness published in 2001 by Rowohlt Taschenbuch Verlag in Reinbek bei Hamburg, Germany. This edition features an afterword by Frank Göhre, German translation by Klaus Fröba, cover design by Cathrin Günther, and illustration by Jürgen Mick. The title literally translates as "death of the moles." The front cover design is similar to other covers in the rororo series, featuring a green speckled background with an overlaid large block-style print of an animal, a beaded band, and a foreground composite element. The author name, book title, and publisher logo are printed in tan. The back cover is dark green and printed in tan is a synopsis of the novel. The bar code and price are printed at the bottom. The inside front and inside back covers are pale turquoise. Binding: Full-color paper covers. The spine is dark green and contains the author name, book title and series number printed in tan, horizontally, bottom to top.